The environment plays a crucial role in people’s physical, mental and social well-being. Despite significant improvements, major differences in environmental quality and human health remain between and within European countries. 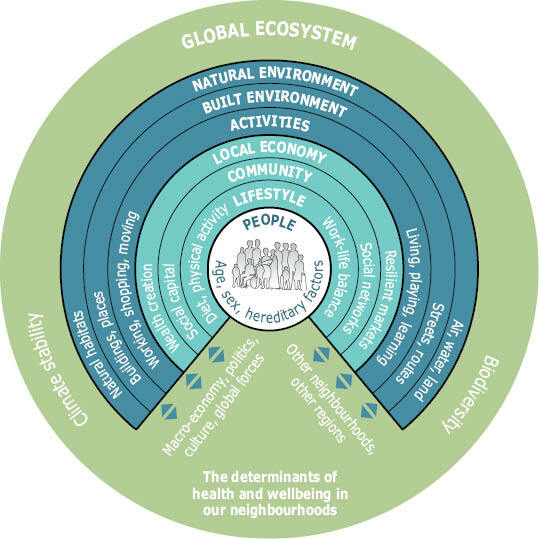 The complex relationships between environmental factors and human health, taking into account multiple pathways and interactions, should be seen in a broader spatial, socio-economic and cultural context. In 2006, life expectancy at birth in the EU-27 was among the highest in the world — almost 76 years for men and 82 years for women ( 1 ). Most of the gain in life expectancy in recent decades has been due to improved survival of people above the age of 65, while before 1950 it was mostly due to a reduction in premature deaths (i.e. death below the age of 65). On average, men are expected to live almost 81% of their lives free of disability, and women 75% ( 2 ). There are, however, differences between genders, and between Member States. The degradation of the environment, through air pollution, noise, chemicals, poor quality water and loss of natural areas, combined with lifestyle changes, may be contributing to substantial increases in rates of obesity, diabetes, diseases of the cardiovascular and nervous systems and cancer — all of which are major public health problems for Europe’s population ( 3 ). Reproductive and mental health problems are also on the rise. Asthma, allergies (4), and some types of cancer related to environmental pressures are of particular concern for children. The World Health Organization (WHO) estimates the environmental burden of disease in the pan-European region at between 15 and 20% of total deaths, and 18 to 20% of disability-adjusted life years (DALYs)( A ), with a relatively higher burden in the eastern part of the region ( 5 ). The preliminary results of a study conducted in Belgium, Finland, France, Germany, Italy and the Netherlands, indicate that 6 to 12% of the total burden of disease could be attributed to nine selected environmental factors, out of which particulate matter, noise, radon, and environmental tobacco smoke were leading. Due to uncertainties, the results need to be interpreted with caution as an indicative ranking of environmental health impacts only ( 6 ). The significant differences in the quality of the environment across Europe depend on the varying pressures related, for example, to urbanisation, pollution and natural resource use. Exposures and associated health risks, as well as the benefits of pollution reduction and of a natural environment, are not uniformly distributed within populations. Studies show that poor environmental conditions affect vulnerable groups especially ( 7 ). The evidence is scarce, but shows that deprived communities are more likely to be affected; for example, in Scotland, mortality rates in people aged under 75 in the 10% most deprived areas were three times higher than those in the 10% least deprived ( 8 ). Source: Barton and Grant ( a ). Better understanding of differences in the social distribution of environmental quality can be helpful for policy, since specific population groups, such as those on low incomes, children, and the elderly, may be more vulnerable — mostly due to their health, economic and educational status, access to health care, and lifestyle factors that affect their adaptation and coping capacities ( 7 ) ( 9 ) ( 10 ). The environmental burden of disease (EBD) represents the proportion of ill health attributed to exposure to environmental factors. Use of the EBD approach allows: comparison of health losses due to different risk factors; setting priorities; and evaluating the benefits of specific measures. However, the results are likely to underestimate the overall environmental burden as they focus on single risk factors and health outcomes, rather than taking full account of complex causal pathways. Estimates of similar issues may vary, depending on the underlying assumptions, methods and data used; and, for many risk factors EBD estimates are not yet available ( c ) ( d ). 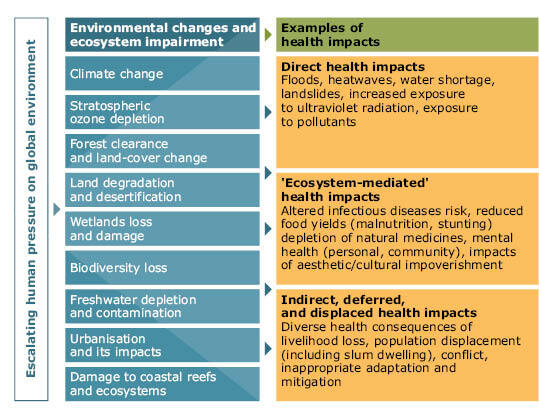 Attribution of the role of the environment in the development of diseases, and the development of novel assessment approaches aimed at taking the inherent complexity and uncertainty of environment and health interactions into account, remain a subject of intense debate ( e ) ( f ) (g). The main European policies aim to provide an environment in which the level of pollution does not give rise to harmful effects on human health and the environment, and vulnerable population groups are protected. They are the 6th Environment Action Programme (6thEAP)( 11 ), the EU Environment and Health Strategy ( 12 ) and Action Plan 2004–2010( 13 ), and the pan-European WHO Environment and Health process ( 14 ) ( 15 ). Note: Healthy life years (HLY) at birth — the number of years a person at birth is expected to live in a healthy condition. Life expectancy (LE) at birth — the number of years a newborn child is expected to live, assuming that the age-specific mortality levels remain constant. Data coverage: no HLY data for Bulgaria, Switzerland, Croatia, Liechtenstein, and the former Yugoslav Republic of Macedonia. Time coverage: 2006 data used for LE for Italy and EU-27. 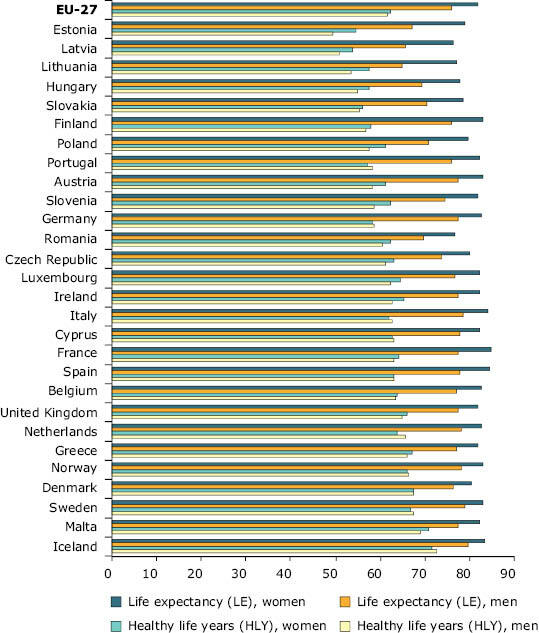 Source: European Community Health Indicators ( b ). Several areas for action have been identified, related to air and noise pollution; water protection; chemicals, including harmful substances such as pesticides; and improving the quality of life, especially in urban areas. The Environment and Health process aims at achieving a better understanding of the environmental threats to human health; reducing the disease burden caused by environmental factors; strengthening EU capacity for policymaking in this area; and identifying and preventing new environmental health threats ( 12 ). While EU policy emphasis is on reducing pollution and the disturbance of crucial services provided by the environment, there is also a growing recognition of the benefits of the natural, biologically diverse environment to human health and well-being ( 16 ). Furthermore, it is worth noting that most health-related pollution policies are targeted to the outdoor environment. A somewhat neglected area in this regard is the indoor environment — considering that European citizens spend up to 90% of their time indoors. The quality of indoor environment is affected by ambient air quality; building materials and ventilation; consumer products, including furnishings and electrical appliances, cleaning and household products; occupants’ behaviour, including smoking; and building maintenance (for example, energy saving measures). Exposure to particulate matter and chemicals, combustion products, and to dampness, moulds and other biological agents has been linked to asthma and allergic symptoms, lung cancer, and other respiratory and cardiovascular diseases ( h ) ( i ). Recent assessments of the sources of, exposure to and policies related to indoor air pollution have analysed the benefits of different measures. The highest health benefits are linked to smoking restrictions. Building and ventilation policies that control indoor exposure to particulate matter, allergens, ozone, radon and noise from outdoors offer high long-term benefits. Better building management, prevention of moisture accumulation and mould growth, and prevention of exposure to exhausts from indoor combustion can bring substantial medium to long-term benefits. Substantial short to medium term benefits result from harmonised testing and labelling of indoor materials and consumer products ( h ). In Europe, there have been successful reductions in the levels of sulphur dioxide (SO2) and carbon monoxide (CO) in ambient air, as well as marked reductions in NOX. Also, lead concentrations have declined considerably with the introduction of unleaded petrol. However, exposure to particulate matter (PM) and ozone (O3) remain of major environment-related health concern, linked to a loss of life expectancy, acute and chronic respiratory and cardiovascular effects, impaired lung development in children, and reduced birth weight( 17 ). Over the past decade, ozone concentrations have frequently and widely exceeded health- and ecosystem-related target values. The Clean Air for Europe (CAFE) programme estimated that at current levels of ground-level ozone, exposure to concentrations exceeding the health-related target value ( B ) is associated with more than 20000premature deaths in EU-25 ( C ) annually ( 18 ). Note: Only urban and sub-urban background monitoring stations are included. Since O3 and the majority of PM10 are formed in the atmosphere, meteorological conditions have a decisive influence on the airborne concentrations. This explains at least partly inter-annual variations and for example the high O3 levels in 2003, a year with extended heat waves during summer. In the period 1997 to 2008, 13 to 62% of Europe’s urban population was potentially exposed to ambient air concentrations of fine and coarse particulate matter (PM10) ( D ) in excess of the EU limit value set for the protection of human health ( E ).However, particulate matter has no threshold concentration, thus adverse health effects can also occur below the limit values. The fine-particulate fraction (PM2.5) ( F ) represents a particular health concern because these can penetrate the respiratory system deeply and be absorbed into the bloodstream. An assessment of the health impacts of exposure to PM2.5 in EEA-32 countries in 2005 indicated that almost 5 million lost life years could be attributed to this pollutant( G ). Reducing such exposure has recently been shown to bring measurable health gains in the United States of America, where life expectancy increased most in the regions with the largest reductions in PM2.5 over the past 20 years ( 19 ). PM10 and PM2.5 concentrations are indicators of complex mixtures of pollutants and are used as proxies for the particulate characteristics responsible for the effects. Other indicators, such as black smoke, elemental carbon, and the number of particles, might provide a better link to the sources of pollution which need mitigation in response to specific health effects. This could be beneficial for targeted abatement strategies and setting air quality standards ( 20 ). Evidence is increasing that the chemical properties and composition of particles, along with their mass, are important for health impacts( 21 ). For example, benzo(a)pyrene (BaP), which is a marker of carcinogenic polycyclic aromatic hydrocarbons, is emitted mainly from the burning of organic material and mobile sources. High levels of BaP occur in some regions, such as the Czech Republic and Poland( 22 ). The increasing wood burning in homes in some parts of Europe may become an even more prominent source of such hazardous pollutants. Climate change mitigation strategies may also play a role, by stimulating use of wood and biomass as domestic energy sources. The 6th EAP sets the long-term objective of achieving levels of air quality that do not give rise to unacceptable impacts on, and risks to, human health and the environment. Its subsequent Thematic Strategy on air pollution( 23 ) set interim objectives through the improvement of air quality by 2020. The Air Quality Directive( 24 ) has set legally binding limits for PM2.5 and for organic compounds such as benzene. It has also introduced additional PM2.5 objectives, based on the average exposure indicator (AEI) ( H ) to determine a required percentage reduction to be attained in 2020. Furthermore, several international bodies are discussing the setting of targets for 2050 in relation to the long-term environmental objectives of European policies and international protocols ( 25 ). Source: EEA, ETC Air and Climate Change ( j ). Air quality is worse in urban areas than in rural areas. 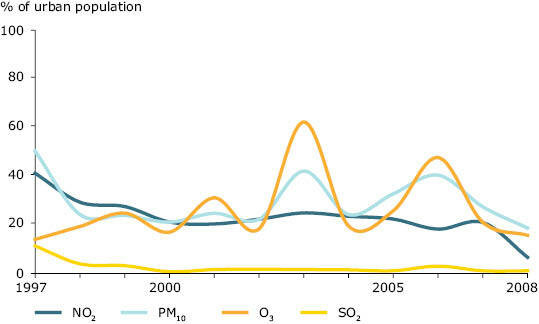 Yearly average PM10 concentrations in the European urban environment have not changed significantly over the past decade. The main sources are road traffic, industrial activities, and the use of fossil fuels for heating and energy production. Motorised traffic is the major source of the PMfractions responsible for adverse health effects, which also come from non-exhaust PM emissions, for example, brake and tyre wear or re-suspended particles from pavement materials. Meanwhile, road traffic injuries, with an estimated more than 4million incidents in the EU every year, remain an important public health issue. There were 39000 fatalities in the EU in 2008; 23% of fatal accidents in built-up areas affected people under the age of25( 26 )( 27 ). 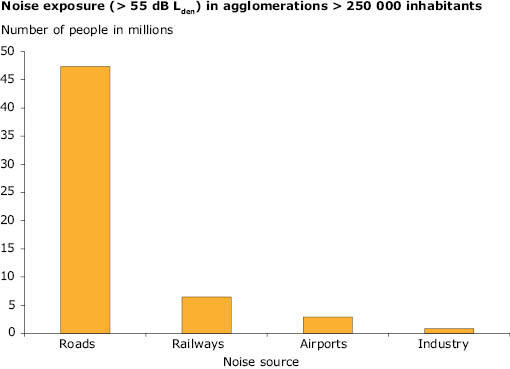 Transport sources also account for a substantial proportion of human exposure to noise, which has negative impacts on human health and well-being ( 28 ). Data delivered in accordance with the Directive on Environmental Noise ( 29 ) are available through the Noise Observation and Information Service for Europe ( 30 ). 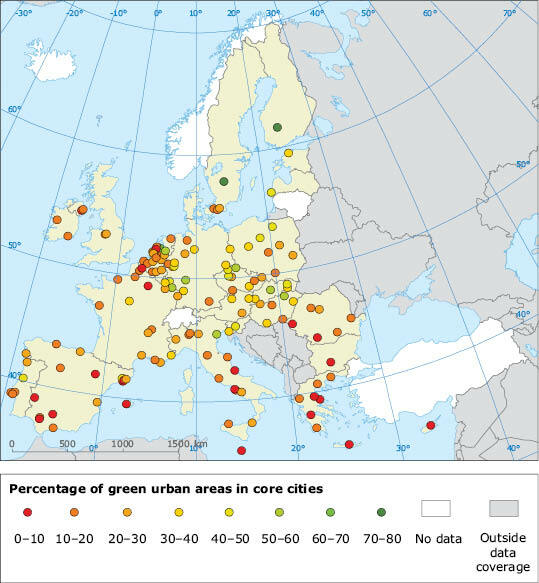 Approximately 40% of the population living in the largest cities in the EU-27 may be exposed to long-term average road traffic noise levels( I ) exceeding 55 decibels (dB), and at night, almost 34million people may be exposed to long-term average road noise levels( I ) exceeding 50 dB. The WHO night noise guidelines for Europe recommend that people should not be exposed to night noise greater than 40 dB. Night-time noise levels of 55 dB, described as ‘increasingly dangerous to public health’, should be considered as an interim target in situations where theachievement of the guidelines is not feasible( 28 ). According to a German Environmental Survey for Children, children from families of low socio-economic status are more heavily exposed to traffic, and annoyed by road traffic noise, during the day, as compared with children with higher socio-economic status ( 31 ). Urban air quality and noise often share a common source and may cluster spatially. There are examples, such as Berlin, of successful integrated approaches to reducing both local air pollution and noise levels ( 32 ). Source: NOISE ( k ). Wastewater treatment, and the quality of both drinking and bathing water have improved significantly in Europe over the past 20 years, but continued efforts are needed to further improve the quality of water resources. Human health can be affected through a lack of access to safe drinking water, inadequate sanitation, the consumption of contaminated freshwater and seafood, as well as exposure to contaminated bathing water. The bio-accumulation of mercury and some persistent organic pollutants, for example, can be high enough to raise health concerns in vulnerable population groups such as pregnant women ( 33 ) ( 34 ). Understanding of the relative contribution of different exposure routes is, however, incomplete. The burden of water-borne diseases in Europe is difficult to estimate and most likely underestimated ( 35 ). The Drinking Water Directive (DWD) sets quality standards for water ‘at the tap’ ( 36 ). The majority of the European population receives treated drinking water from municipal supply systems. Thus, health threats are infrequent and occur primarily when contamination of the water source coincides with a failure in the treatment process. While the DWD addresses water supplies serving more than 50people, a European data exchange and reporting system applies only to supplies for more than 5000 people. In a 2009 survey, the compliance rate with drinking water standards in smaller supplies was 65%, while for larger ones exceeded 95% ( 37 ). In 2008, 10 out of 12 outbreaks of waterborne diseases reported in the EU-27 were linked to the contamination of private wells ( 38 ). Implementation of the Urban Wastewater Treatment Directive (UWWTD) ( 39 ) remains incomplete in many countries ( 40 ). However, EU-12 Member States have staggered transition periods for full implementation ranging up to 2018. The UWWTD addresses agglomerations with a population of 2000 or more; thus potential public health risks linked to sanitation exist in some rural areas of Europe. For these areas, complementary, ‘low-technology’ solutions are available. Note: Only countries with data for virtually all of each period were included, the numbers of countries are given in parentheses. Regional percentages have been weighted by country population. North: Norway, Sweden, Finland and Iceland. Central: Austria, Denmark, England and Wales, Scotland, the Netherlands, Germany, Switzerland, Luxembourg and Ireland. For Denmark no data have been reported to the joint questionnaire since 1998. However, according to the European Commission, Denmark has achieved 100% compliance with secondary treatment and 88% compliance with more stringent treatment requirements (with respect to load generated) under the UWWTD. This is not accounted for in the figure. South: Cyprus, Greece, France, Malta, Spain and Portugal (Greece only up to 1997 and then since 2007). East: Czech Republic, Estonia, Hungary, Latvia, Lithuania, Poland, Slovenia, Slovakia. South-east: Bulgaria, Romania and Turkey. Source: EEA, ETC Water (CSI 24, based on OECD/Eurostat Joint Questionnaire 2008). 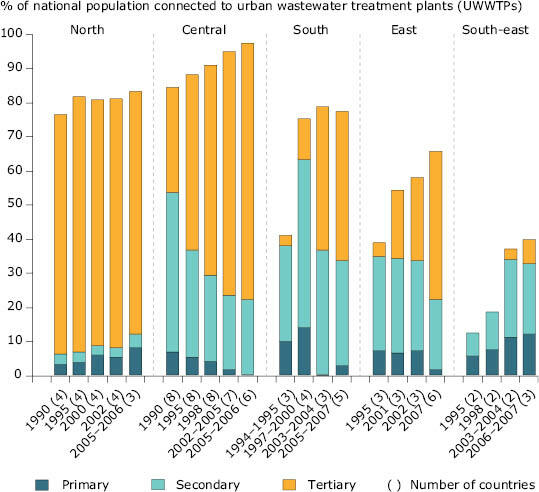 The implementation of the UWWTD has led to an increasing proportion of Europe’s population being connected to a municipal treatment works. The assoc iated improvements in wastewater treatment have resulted in a decline in the discharges of nutrients, microbes and some hazardous chemicals to receiving waters, and substantial improvement in the microbial quality of Europe’s inland and coastal bathing waters ( 41 ). Whilst wastewater treatment has improved, both point and diffuse pollutant sources are still significant in parts of Europe and health risks remain. For example, algal blooms linked to excessive nutrient levels, particularly during extended periods of hot weather, are associated with toxin-producing cyanobacteria — which, in turn, can cause allergic reactions, skin and eye irritation and gastroenteritis in exposed people. Large populations of cyanobacteria can occur in European water bodies used for drinking water, aquaculture, recreation and tourism ( 42 ). Looking ahead, major investment will be needed to maintain existing wastewater treatment infrastructures ( 43 ). In addition, the discharge of some pollutants in treated effluent can raise environmental concerns, for example, endocrine-disrupting chemicals ( 44 ) or pharmaceuticals( 45 )( 46 ). While wastewater treatment at municipal plants will continue to play a critical role, complementary approaches, such as tackling pollutants at source need to be explored more extensively. New legislation related to chemicals (such as the Registration, Evaluation, Authorisation and Restriction of Chemical regulation (REACH)( 47 ) and the Environmental Quality Standards (EQS) Directive ( 48 )) are likely to help drive such a source control approach. In combination with the full implementation of the Water Framework Directive ( 49 ), this should lead to a reduced emission of pollutants to water, leading to healthier aquatic ecosystems and reducing risks to human health. Pesticides disrupt essential biological processes, for example through affecting nerve transmission or mimicking hormones. Thus, human health concerns related to exposure via water, food, or close proximity to spraying have been raised ( 50 ) ( 51 ). Due to their intrinsic properties, pesticides can also be harmful to organisms in the wider environment, including freshwater organisms ( 52 ). Mixtures of pesticides are common both in the human food supply( 53 ) and in the aquatic environment. Though assessment of mixture toxicity has been a challenge, a single-chemical approach is likely to underestimate ecological risk, including impacts of mixture of pesticides on fish ( 54 ) and amphibians ( 55 ). The EU Thematic Strategy on the sustainable use of pesticides ( 56 ) sets objectives to minimise the hazards and risks to health and the environment stemming from the use of pesticides, and to improve controls on the use and distribution of pesticides. Full implementation of the associated Pesticides Directive will be required to support the achievement of good chemical status under the Water Framework Directive ( 49 ). Information on pesticides in surface and ground waters in Europe is limited; however, the reported levels, including pesticides classified as priority substances, can exceed environmental quality standards. Some pesticide impacts are not captured by routine monitoring programs — for example fatal exposure of aquatic species to short-term contamination during rainfall events immediately after pesticide application to cropland ( 57 ). These limitations combined with growing concerns about potential adverse effects strengthen the case for a more precautionary approach to their use in agriculture, horticulture and to control unwanted plant growth in public spaces close to where people live. Water, air, food, consumer products, and indoor dust can play a role in human exposure to chemicals through ingestion, inhalation or contact through skin. Of particular concern are persistent and bio-accumulative compounds, endocrine-disrupting chemicals and heavy metals used in plastics, textiles, cosmetics, dyestuffs, pesticides, electronic goods and food packaging ( 58 ). Exposure to these chemicals has been associated with declining sperm counts, genital malformation, impaired neural development and sexual function, obesity and cancer. Chemicals in consumer goods may also be of concern when products become waste, as many chemicals migrate easily to the environment and can be found in wildlife, ambient air, indoor dust, wastewater and sludge. A relatively new concern in this context is waste electrical and electronic equipment, which contains heavy metals, flame retardants or other hazardous chemicals. Brominated flame retardants, phthalates, bisphenol A, and perfluorinated chemicals are most often discussed because of their suspected health effects and ubiquitous presence in the environment and in humans. Possible combined effects of exposure to a mixture of chemicals found at low levels in the environment or in consumer goods, especially in vulnerable young children, are receiving particular attention. Furthermore, some adult diseases are linked to early-life or even prenatal exposures. The scientific understanding of mixture toxicology has recently been advanced significantly, not least as a result of EU-funded research ( J ). While concerns about chemicals are growing, data for chemical occurrence and their fate in the environment, as well as for exposures and associated risks, remain scarce. There remains a need to establish an information system on concentrations of chemicals in various environmental compartments and in humans. New approaches and use of information technology offer the scope to do this effectively. Furthermore, there is increasing recognition that cumulative risk assessment is necessary to avoid underestimation of risks that might occur under the current paradigm of considering substances on a chemical-by-chemical basis ( 59 ). The European Commission has been asked to take account of ‘chemical cocktails’ and to apply the precautionary principle in considering effects of chemical combinations when drafting new legislation ( 60 ). Good management plays a crucial role in preventing and reducing exposures. A combination of legal, market-based and information-based instruments to support consumer choices is critical, given public concerns about the possible health effects of exposure to chemicals in consumer products. For example, Denmark has published guidelines on how to reduce children’s exposure to chemical cocktails, focusing on phthalates, parabens, and polychlorinated biphenyls (PCBs)( 61 ). In the EU rapid alert system for non-food dangerous products, operating since 2004, chemical risks represented 26% of almost 2000notifications in 2009 ( 62 ). The Registration, Evaluation, Authorisation and Restriction of Chemical regulation (REACH) ( 47 ) aims to improve the protection of human health and the environment from the risks of chemicals. Manufacturers and importers are required to gather information on the properties of chemical substances and propose risk management measures for safe production, use and disposal — and to register the information in a central database. REACH also calls for the progressive substitution of the most dangerous chemicals once suitable alternatives have been identified. However, the regulation does not address simultaneous exposure to multiple chemicals. The efforts to better protect human health and the environment through safer chemical substitutes need to be complemented by a systemic approach to chemicals assessment. Such assessments should include not only toxicity and eco-toxicity, but also address the starting material, water and energy use, transport, release of CO2 and other emissions, as well as waste generation through the life cycle of different chemicals. Such a ‘sustainable chemistry’ approach requires new, resource-efficient production processes and the development of chemicals that use fewer raw materials and are of high quality, with limited impurities to reduce or avoid waste — however, there is no comprehensive legislation on sustainable chemistry in place as yet. Nearly all the environmental and social impacts of climate change (Chapter2) may ultimately affect human health through altering weather patterns, and through changes in water, air and food quality and quantity, ecosystems, agriculture, livelihoods and infrastructure( 63 ). Climate change can multiply risks and existing health problems: potential health effects depend largely on populations’ vulnerability and their ability to adapt. The heat wave in Europe in summer 2003, with a death toll exceeding 70000, highlighted the need for adaptation to a changing climate(64)( 65 ). The elderly and people with particular diseases are at higher risk, and deprived population groups are more vulnerable( 7 )( 66 ). In congested urban areas with high soil sealing and heat absorbing surfaces, the effects of heat waves can be exacerbated due to insufficient nocturnal cooling and poor air exchange ( 67 ). 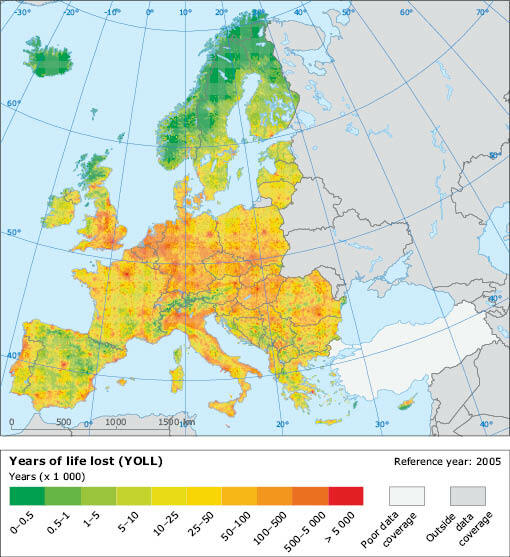 For populations in the EU, mortality has been estimated to increase by 1 to 4% for each degree increase of temperature above a (locally-specific) cut-off point ( 68 ). In the 2020s, the estimated increase in heat-related mortality resulting from projected climate change could exceed 25000per year, mainly in central and southern European regions ( 69 ). An anticipated impact of climate change on the spread of water-, food-and vector-borne ( K ) diseases in Europe emphasises the need for tools to address such threats to public health ( 70 ). Transmission patterns of communicable diseases are also influenced by ecological, social and economic factors, such as changing land-use patterns, declining biological diversity, alterations in human mobility and outdoor activity, as well as access to health care and population immunity. This can be exemplified by the shift in the distribution of ticks, vectors of the lyme disease and tick-borne encephalitis. Other examples include the extended range in Europe of the Asian tiger mosquito, avector of several viruses, with a potential for further transmission and dispersion under the changing climate conditions( 71 )(72). Climate change may also exacerbate existing environmental problems, such as particulate emissions and high ozone concentrations, and pose additional challenges to providing sustainable water and sanitation services. Climate-related changes in air quality and pollen distribution are expected to affect several respiratory diseases. Systematic assessments of the resilience of water supply and sanitation systems to climate change and inclusion of its impacts in water safety plans are needed( 35 ). Nearly 75% of European citizens live in urban areas, and this is expected to increase to 80% by 2020. Under the 6th EAP, the Thematic Strategy on the urban environment ( 73 ) highlights the consequences for human health of the environmental challenges facing cities, the quality of life of urban citizens and the performance of cities. It aims to improve the urban environment, to make it more attractive and healthier to live, work and invest in, while trying to reduce the adverse environmental impacts on the wider environment. The quality of life and health of urban dwellers depends strongly on the quality of the urban environment, functioning in a complex system of interactions with social, economic, and cultural factors( 74 ). Green urban areas play an important role in this context. Amultifunctional network of green urban areas is capable of delivering many environmental, social, and economic benefits: jobs, habitat maintenance; improved local air quality and recreation, to name a few. The benefits of contacts with wildlife and access to safe green spaces for a child’s exploratory, mental and social development have been shown both in urban and rural settings ( 75 ). Health is generally perceived to be better by people living in more natural environments, with agricultural land, forests, grasslands or urban green spaces near the place of residence ( 76 ) ( 77 ). Furthermore, the perceived availability of green urban areas has been shown to reduce annoyance due to noise ( 78 ). Much progress has been achieved through dedicated approaches to improving the quality of the environment and reducing particular burdens on human health — but many threats remain. The predominant drive for material well-being has played a major role in the biological and ecological disturbances witnessed today. Preserving and extending the benefits provided by the environment for human health and well-being will require continuous effort to improve the quality of the environment. Furthermore, these efforts need to be complemented by other measures, including significant changes in lifestyle and human behaviour, as well as consumption patterns. Meanwhile, new challenges are emerging with a wide range of potential, highly uncertain, ecological and human health implications. In this context, technological advancements may provide new benefits — however, history also offers many examples of adverse health impacts from new technologies ( 79 ). Nanotechnology, for example, may allow the development of new products and services which are capable of enhancing human health, conserving natural resources or protecting the environment. However, the unique features of nanomaterials also raise concerns about potential environmental, health, occupational and general safety hazards. The understanding of nanotoxicity is in its infancy, as are methods for assessing and managing the risks inherent in the use of some materials. Given such knowledge gaps and uncertainties, an approach to responsible development new technologies, such as nanotechnologies, could be achieved through ‘inclusive governance’ based on broad stakeholder involvement and early public intervention in research and development ( 80 ). The European Commission has, for example, consulted experts and the public regarding the benefits, risks, concerns and awareness of nanotechnologies to support the preparation of a new action plan for 2010 to 2015 ( 81 ). The increasing awareness of multi-causality, complexity, and uncertainties also means that the EU Treaty principles of precaution and prevention are even more relevant than before. More recognition of the limits of what we can know, in time to prevent harm, is called for, as is the need to act on sufficient, rather than overwhelming, evidence of the potential harms to health, given the pros and cons of action versus inaction. Note: Not all ecosystem changes are included. Some changes can have positive effects (food production, for example). Source: Millennium Ecosystem Assessment ( l ). For references, please go to https://www.eea.europa.eu/soer/synthesis/synthesis/chapter5.xhtml or scan the QR code.